SpectraSensors uses NASA technology to change the world of gas analyzers and leapfrog into the world of big players. Since the early days of natural gas pipelines, processing and petrochemical refining, measuring contaminants in a line was a problem the industry could deal with at a snail's pace. That all changed when computers started running things. Today the analytical portion is one of the most critical points of any operation as the readings are instantly entered into a computer control scheme. A shut down can cost a producer a million dollars a day. And this has led to a small company in Rancho Cucamonga, California, SpectraSensors, becoming a major player in the world of measurement. This is a fact not missed by such prestigious award presenters as Red Herring and Inc. Magazine as they recognized the company's achievement this year. The company's client list now includes virtually all the major oil and gas companies. "In the past, many companies in the natural gas, petrochemical and process industries were flying blind, as far as moisture and other contaminants were concerned," says Dale Langham, an expert process analyst and 35-year veteran of the energy industry. "That is changing quickly, because companies in those industries must squeeze technologies to maximize profits. They simply can't afford the expensive shutdowns, shut-ins and other penalties resulting from slow and inaccurate analyzers in the pipeline." Langham, a vice president in the Houston office of SpectraSensors, Inc., a leading manufacturer of optically-based gas and moisture analyzers, says the need for analyzer speed and accuracy has become so paramount that process and energy-related companies around the world are discarding their old gas sensors for precise tunable diode laser (TDL) based analyzers. But it is the future of TDL that has Langham really excited. "Two years ago we weren't even doing business in refineries, today we are doing moisture analysis, H2S analysis, oxygen analysis, and other measurements. We are making discoveries every day of new measurements we can make." Customers are now looking for new applications and approaching the company with measurement problems that need solutions. What else can TDL measure? Stay tuned. How has the company made such an impact so quickly? Langham sums it up in these words, technologists and sales staff. "We've been able to attract people who are world renown and have a local relationship with our customers. There are two things about this business. It's a small world and it's relationship-based." That sales staff has been able to put the technology in front of the customers. The other key factor is the scientists behind the technology. "We have a staff of PhD's that earned that PhD in tunable diode lasers. So when a customer has a problem, we can solve it from a scientific point of view." Both the TDL analyzer market and acceptance of SpectraSensors has grown rapidly due to the winning combination of acceptance and performance of the technology as well as the unique expertise that the company brings to the marketplace. Typical industrial applications for the TDL-based analyzer include measurement of moisture, carbon dioxide and other corrosives present in the petrochemical and refinery gas processes, moisture analysis in chemical and bulk gases, and measurement of airborne moisture and other atmospheric gases from commercial aircraft. From its Houston office the firm operates a laboratory for analytical development, technical training and field services for the petrochemical market. The same facility accommodates both international and domestic sales teams. Marketplace experience is another important SpectraSensors' differentiator. Charlie Cook, a professional of the natural gas industry for almost 30 years, is Director of Sales and takes the lead in developing products and sales channels for the natural gas markets. Charlie Smith, PhD, Director of Applications Engineering, is a recognized professional on the user side of the petrochemical industry with experience ranging from exploration to R&D. In addition, the firm employs a sales and marketing staff that includes over 50 years experience with Al Kania, Jorge Jones, and Dave Novak. A recent round of funding led by Nomura's New Energy & Clean Technology Ventures (joined by American River Ventures, Blueprint Ventures and Nth Power LLC as well as the venture capital arm of Chevron Technology Ventures), has put SpectraSensors on a firm financial foundation. "This company has experienced exceptional growth over the past four years and has attracted blue chip North American energy customers," said Russell Pullan, Director of Nomura's New Energy & Clean Technology Ventures. "Our decision to lead this round of financing demonstrates our confidence in SpectraSensors' seasoned management team. There is a lot of excitement in the industry over the company's' recent launch of new products such as an innovative hydrogen sulphide analyzer and a unit to measure the energy content of gas. With its innovative laser technology and real-time measurement, we believe they are well on their way to becoming an industry leader and the number one global supplier for gas-quality measurement." Expansion and acquisitions are a natural part of the company's growth. The company moved into an expanded Rancho Cucamonga facility this year after opening the Houston facility in 2006. Also in 2007 SpectraSensors acquired Integrated Information Technologies (IIT), a leader in Supervisory Control and Data Acquisition (SCADA) and other software products for energy measurement in natural gas pipelines. Essentially, a TDL-based gas analyzer uses laser (light) absorption spectroscopy to identify or detect one or more gases in a flow of gases. This type of analyzer, pioneered by SpectraSensors, uses a tunable laser to measure the concentration of target gases (e.g. H20, CO2, H2S) by monitoring the absorption of light at wavelengths specific to those gases. 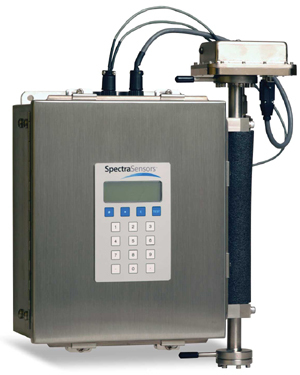 The SpectraSensors gas analyzer line is designed to provide extremely fast and accurate readings without expensive labor and replacement costs. That is because the gas is analyzed away from the stream in a sample cell. As the laser light passes through the gas sample in the cell, the presence of any target gas is detected and its concentration measured. "This design is very process worthy," says Langham. "The TDL-based analyzer technology has proven to be so reliable and trustworthy that it is the new standard for many natural gas companies, and is being adopted by oil refineries, petrochemical plants and process industries all over the world." Langham notes that readings from traditional gas sensors are inherently slow because they rely on diffusion of the sampled gas into the sensor's detection elements. For instance, moisture sensors must slowly dry down before they begins to provide accurate measurements – a process that typically requires 10-12 minutes or more between readings for contaminant-vulnerable quartz crystal and electrochemical sensors. TDL analyzers provide results in seconds with low maintenance. Moisture and H2S problems are detected with parts-per billion accuracy and measurement intervals as frequently as one second, enabling practically instantaneous response, and thereby eliminating the chance of bad readings, damaged equipment, and false shut-ins. Langham says a relatively short payback period can be realized on the TDL analyzer in spite of a higher initial purchase price. By eliminating the cost of consumables, extra sensor heads, maintenance labor and other overhead, the savings and ROI mount up quickly. When considering the savings realized, such as by avoiding unnecessary pipeline shut-ins, preventable dehydration costs or pipeline venting – it becomes easy to understand why overcoming a single event caused by false sensor information would pay for the TDL-based analyzer many times over. This new technology has taken SpectraSensors into the world of big players in the petrochemical industry. And the big players are lining up.